True men come in all sizes, ages, and physical abilities. 10-year-old Avery Price who often uses a wheelchair and requires braces on his legs, put anthem protesters to shame with one simple gesture he made during the national anthem at the Putnam County Fair in Tennessee, Price impressed almost everybody when he managed to stand for the flag. 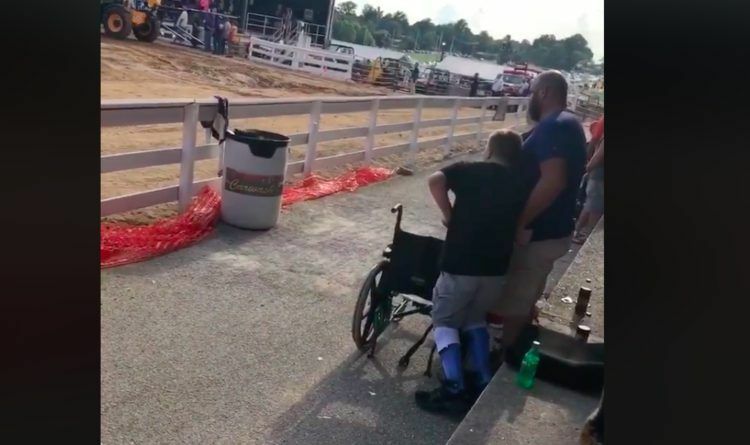 Even though Price has difficulty using his legs, he still wanted to show his patriotism when he heard the anthem playing at the Putnam County Fair in Cookeville. But, a healthy NFL prayer with two good legs can’t.. shame on them. Patriotism starts at a young age and at home, good for his parents. In the viral video, the young boy can be seen standing in the video, leaning on who the outlet identified as his father, as well as his wheelchair, in order to remain upright for the anthem. Price’s parents told how proud they are of the example their son set while standing. Inspiring!!! It takes a kid to show men what respect for America is all about!! NFL protesters could take lessons from this young man. Disabled or not, this kid will go far in life. Disability is a state of mind. May all your dreams come true, Avery! Share this article if you are proud of this young patriot!